Three, you can leave a comment on this very blog. If we had the means, we would also accept messages by carrier pigeon, tom-tom, smoke signal, and Morse code. It's safer just to use one of the three methods described above. In any case, please write to us and tell us how we're doing, what you like, what you don't like, how we can improve--whatever you have to say, we'd like to hear from you. Write today! Black Bat artist Matt Marshall has created a video for "Origin of The Black Bat," his first comic book story and the lead story for Five Star Comics #2. You can see the video, "5 STAR COMICS #2: ORIGIN OF THE BLACK BAT!" 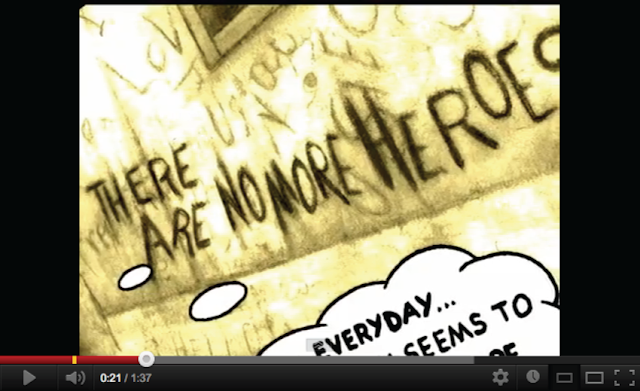 on YouTube, here. For those eagerly awaiting the second issue of Five Star Comics--it has arrived! Five Star Comics #2, with a cover and a lead story by Black Bat artist Matt Marshall, is now in print. The newest issue of our comic book made its debut at the Small Press and Alternative Comics Expo (S.P.A.C.E.) during the weekend of April 21-22, 2012, in Columbus, Ohio, and is now available to readers. Ordering information is below. In the meantime, have a look at a sampling from Five Star Comics #2. In the lead story of Five Star Comics #2, Matt Marshall reveals the origin of The Black Bat--the NEW Black Bat, son of the original from the pulp magazines of the 1930s and '40s. Matt's artwork is like nothing you have seen before in the comics and unlike anything you're likely to see anytime soon. Missile, great granddaughter of the Golden Age superhero Silver Streak, returns to face an old foe in "The Trojan Cuckoo." 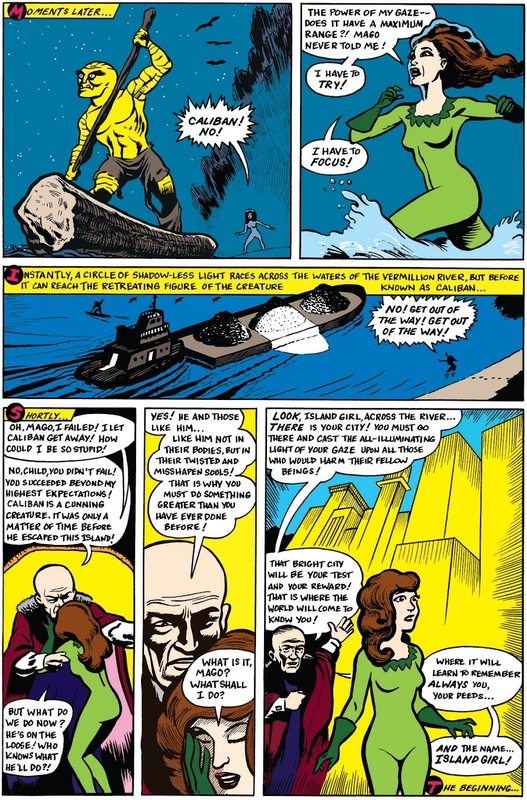 Larry Blake created Missile for the first issue of Five Star Comics and handled the penciling on this story. Tim Corrigan provided the inks. 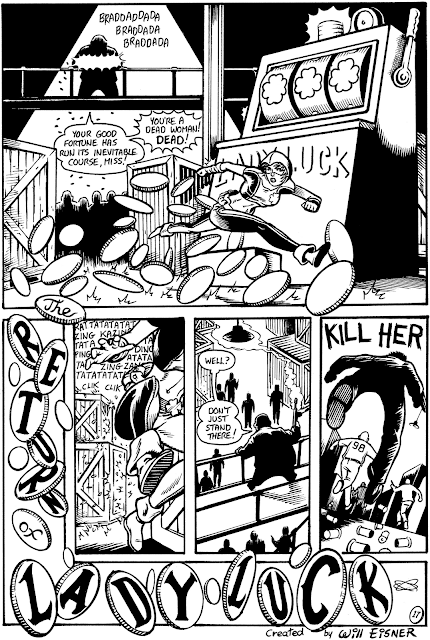 Next up: Gary Gibeaut wrote, penciled, and inked a tribute to Will Eisner's original Lady Luck. The story is called "The Return of Lady Luck" and features a new incarnation of the 1940s Lady Luck drawn by Klaus Nordling. The whole gang collaborated on "The Case of the Nutcase," a story featuring The Amalga-Mates, the first all-original characters to appear in Five Star Comics. In real life, The Amalga-Mates are Hemsworth V. Hemsworth and Semyon Hemsworth, millionaire philanthropists. Donning the trappings of their alter egos, they become the world's first and only Siamese twin superheroes! 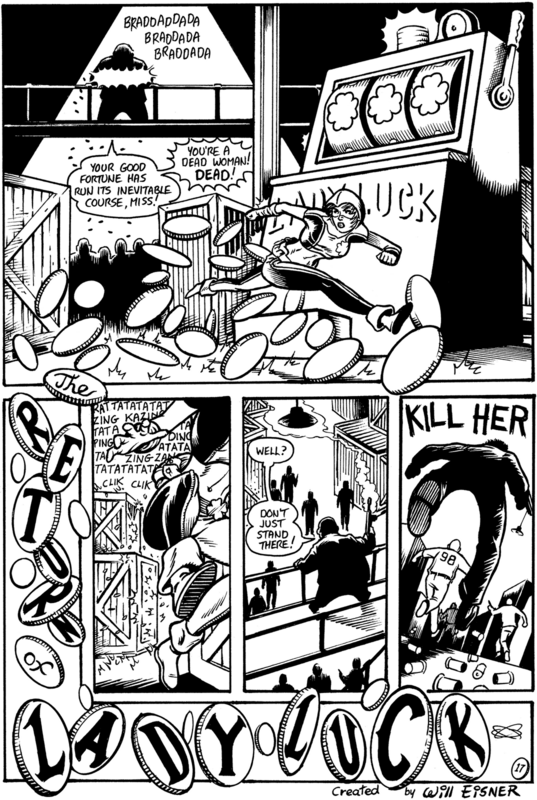 Tim Corrigan penciled a script by Terence Hanley. The inking came from Many Hands. Cave Girl returns to Five Star Comics in a ten-page story, "Cave Girl and the Bat King," written and drawn by Terence Hanley. And what do you get for your five dollars? Five stories by five artists and featuring five (or six) protagonists, plus two pages of letters, a preview of Miss Masque, and a full-color photo-collage of Cave Girl by Larry Blake on the back cover. Order yours today. Larry Blake, Terence Hanley, and Gary Gibeaut have put together an excellent comic book featuring some Golden Age heroes that are now in the public domain, and each story is outstanding in story and art. This has to be the best comic I've received this year so far. 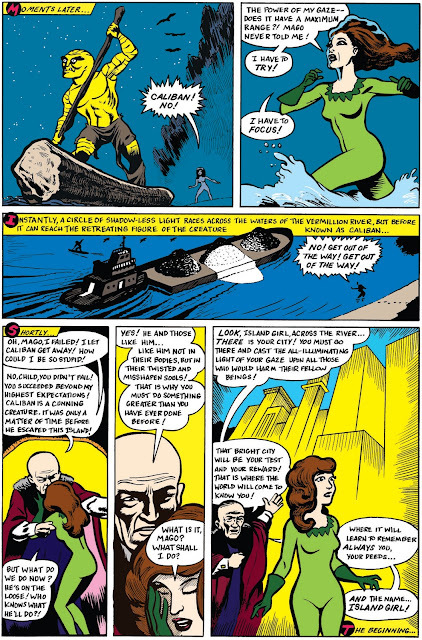 Five Star Comics features Five heroes in Five distinct strips that all have the Golden Age feel and an exceptional display of artistic talent. Moth Man, Silver Streak, Marvel Maid, Flip Falcon, and Cave Girl! Order this comic, you will not be disappointed! On Five Star Comics: "outstanding Golden Age-ist comic"
On "Cave Girl": "I just love the artwork in this . 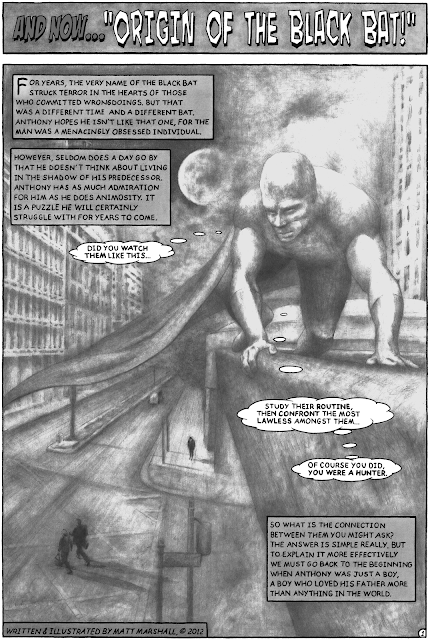 . . brilliant work"
On "Moth Man Meets Mothman": "beautiful cartooning style . . . gorgeous . 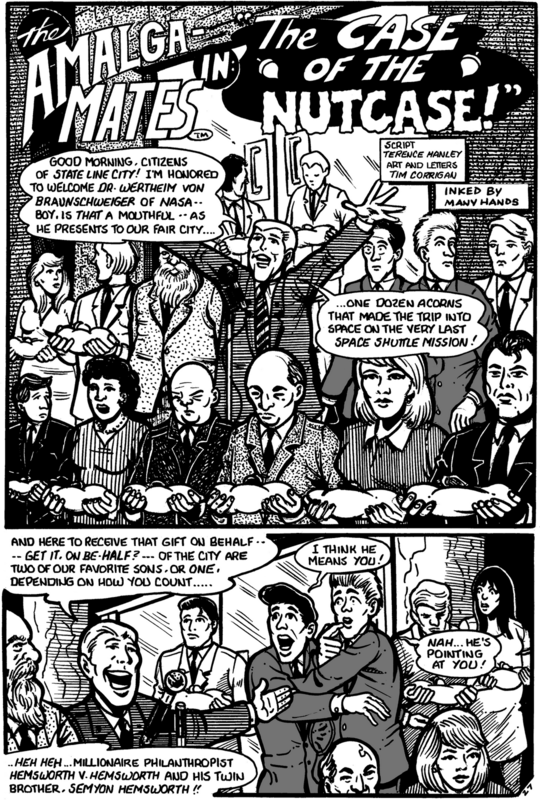 . . bold [inking]"
In a world of dreary, dark, photographed/photoshopped anti-hero comic books, there are a few (but fortunately, growing) number of cartoonists creating fun, classically fashioned, cartoony comic books. I can now add 5 Star Comics to the list! It’s a fun book created by cartoonists who are more in command of their craft with each project they work on. That bodes well for 5 Star Comics and its readers. I’ll be one of them. Readers, Larry [Blake] has collaborated with some other creative types to come up with a very special comic book! It's called "5 Star Comics" and it is a real unique concept. Public domain heroes from the Golden Age of Comics are revived for this title, and the results are fun, and full of the same kind of enthusiasm and verve that the original material had. So, how would it be if actual Golden Age comic book heroes were to appear in brand new adventures? Well, this book is a dream come true. Larry Blake has joined Terence Hanley, Jordan Lowe, and Gary Gibeaut to offer adventures of these real Golden Age comic book characters in the public domain, and the results are just delightful. There's a sense of wonder and naivety to those early efforts, to the first material produced specifically for the comics market around 1940, and if you enjoyed Fantagraphics' Supermen! The First Wave of Comic Book Heroes book reprints from that era, you will get a kick out of the adventures of Moth Man, Silver Streak, Marvel Maid, Flip Falcon, and Cave Girl! . . . [T]his new collection is a great homage to that era. 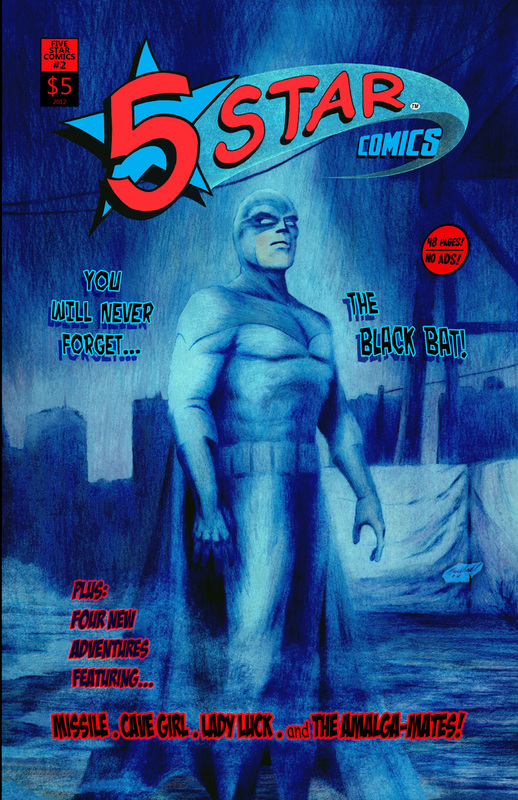 Five Star Comics #1--Full-color cover, 37 pages black-and-white interior, plus a preview of The Black Bat on the back cover. It has been a busy spring for Five Star Comics and the artists and writers behind this new title. Five Star creator Terence Hanley has driven all over the Ohio Valley, attending conventions in Lexington (March 24), Dayton (March 31-April 1), Columbus (April 21-22), Fort Wayne (May 12), and Athens, Ohio (May 26). Terence's Mothman, Aliens, and Flying Saucers Coloring Book and Monsters and Aliens of America Coloring Book continue to sell well to investigators of the paranormal and the extraterrestrial. 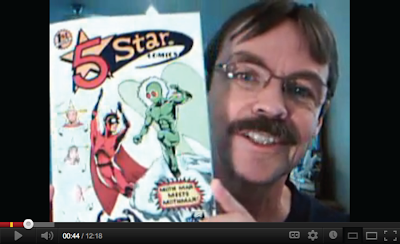 Five Star Comics #1 is a hit with fans of Golden Age comic books. And Lucky Girl #1 has drawn the attention of discerning readers. Larry Blake, Tim Corrigan, and Gary Gibeaut have also been to conventions this spring and have sold their art, comic books, stickers, and other items. The Lexington Comic and Toy Convention, a bustling show held at the Convention Center in Lexington, Kentucky, was a big success for its organizers. Over 4,000 people attended. In addition to selling his books, Terence drew convention sketches, sketch cards, and a commissioned drawing of a pulp cover featuring a previously unknown pulp author, Luke Dodd. Terence also met comic professional Bob McLeod and picked up Mr. McLeod's first children's book, the funny and beautifully illustrated Superhero ABC. 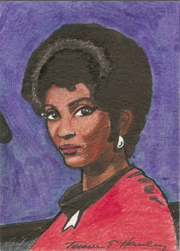 The organizers of the show also published a convention comic book in which Terence's new character, Island Girl, made her debut--and in color. Island Girl is just one of a new line of superheroes and heroines Terence is developing for a future series. Island Girl makes her debut in the Lexington Comic and Toy Convention comic. Terence was back in Ohio the following weekend for the two-day Gem City Comic Con, held at the Student Union at Wright State University. Comic book dealers took up the big convention hall, while artists' alley was located in a smaller room across the entryway. It was an encouraging sign to see families and children at the show. Monsters and Aliens of America was the big seller, but Terence's sketch cards were popular, too. 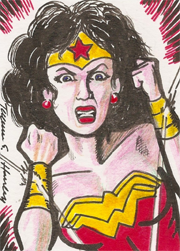 Wonder Woman was on hand to see herself depicted on a sketch card, and although the sketch card might be good, it can't compare to the real Wonder Woman. Terence also picked up a comic book page by Ohio artist Dan Davis. The Small Press and Alternative Comics Expo--S.P.A.C.E.--was the big event in April. Five Star creators Larry Blake, Tim Corrigan, Gary Gibeaut, and Terence Hanley were on hand for the premiere of their second issue of Five Star Comics! Chock-full of art, Five Star Comics #2 is the work of five artists and writers, with five (or six) heroic protagonists starring in five stories. Attendees of the expo loved the comic and its predecessor, Five Star Comics #1. They also picked up original art by Larry Blake, Mothman stickers by Gary Gibeaut, and Tim Corrigan's Comics and Stories. Tim Corrigan's sons, Nate and Matt, were also on hand to sell their books. Unfortunately Matt Marshall, the cover artist and creator of the lead story, "Origin of The Black Bat," wasn't available for the public's first look at his first-ever comic book story. Comic book fan, reader, and writer Mike Tuz made the long trip from the East Coast to the Midwest to meet some of the creators he has known only by letter for so long. It looks like Mike could become a contributor to Five Star Comics in the not-very-distant future. Finally, one of the highlights of the show for Terence was his being interviewed by Ian and Kathleen, young creators of the brand new Glen Echo Review. If you haven't seen this fine publication yet, you should run out and get your copy today! Five Star Comics #2 with cover art by Matt Marshall, new for S.P.A.C.E. 2012! Terence returned to his home state of Indiana in May for the Summit City Comic Con, which took place in The Grand Wayne Center in Fort Wayne. This year's Summit City Comic Con was another family-friendly event (the best kind). There were lots of kids and lots of people in costume. The show's organizers continue to put on a good convention with plenty of room and good services for the artists and good attendance by the public. Terence drew a picture of the Froglodyte, a singular creature created by Sydney, and one to match her brother's Mist Dragon from last year. Finally, this weekend, Larry Blake and Terence Hanley were at the inaugural Ratha Con, held at the Athens Community Center in Athens, Ohio. Once again, Larry's original art was very popular, especially his drawings of Ol' Shellhead. Attendance was not very high on a hot afternoon, but the room was cool and made all the cooler by the artists, dealers, exhibitors, attendees, and volunteers. Other Athens-area artists in attendance included Sandy Plunkett, Katherine Wirick, Ryan Spellman, and Steve Richter. Ratha Con was Steve's first comic book convention. Welcome to the club, Steve. Next up: The Tri-State Comic Con--TriCon--scheduled for Saturday, June 9, 2012, at the Big Sandy Superstore Arena, Huntington, West Virginia. See you there!